Being a large capacity multi-service access platform and with a chassis of 7U, HC-DM3600 can support 15 function cards, 2 power supply cards (1 redundant module) and one management card. There are two kinds of management card: MCU card and MCUS1 card. The MCU card provide 2048×2048 cross-connect matrix. While the MCUS1 card which offer one STM-1 optical port as uplink can provide 4096×4096 cross-connect matrix. And HC-DM3600 support the management of all the plugged-in cards and the remote devices by the management card through NM software--- HCView. 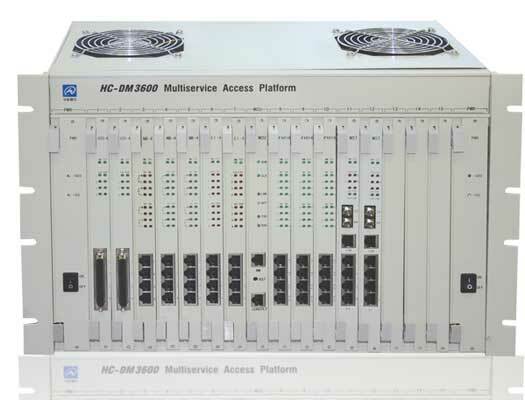 HC-DM3600 supports many kinds of TDM-based service, such as E1, V35, FXO, FXS, G.SHDSL, Etherent, etc. MCU card: Provide 2048×2048 non-blocking cross-connect matrix. One NM port for management and one CONSOLE port. MCUS1 card: Provide 4096×4096 non-blocking cross-connect matrix. One 155M (STM-1) optical port for uplink, two framed E1 ports, one NM port for management and one CONSOLE port. (MCU) 2048×2048 non-blocking cross-connect matrix. 4-port G.SHDSL card to extend the range of E1 over 2-wire cable up to 4Km (24 AWG).